Hurry to print a new $2.00/1 manufacturer coupon for Maybelline face products; then use it to score a great deal on Maybelline at Rite Aid! Next week, all Maybelline cosmetics will be buy one get one 50% off. They are also included in a Plenti Points promotion: spend $15.00 and receive 500 Plenti Points. Buy four Maybelline New York Fit Me! 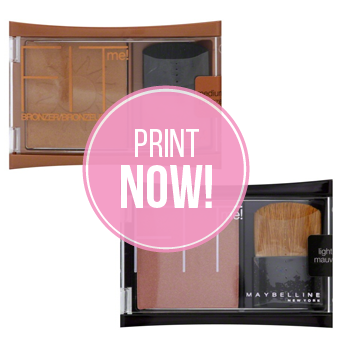 Bronzers or Blushes and use four $2.00/1 coupons. Pay $7.87 out of pocket and receive 500 Plenti Points. The Points are equal to $5.00 which can be used to pay for a future purchase. After the sale, coupons and Points, each blush or bronzer will be $0.72! You will need more than one computer to do this deal. Total $7.87 plus receive 500 Plenti Points, making them only $2.87 or 72¢ each after coupons and points!